ASAP Recovery Ltd is a friendly and professional family run business. We are based in Kingswinford in the West midlands and have been established for the past 25 years. We specialise in Scrap Metal Recycling and Skip Hire for both residential and commercial properties. Grab Hire and Driver now available for hire. Dirt and Brick Removal. We also supply and deliver all your hard-core, top soil, crushed bricks and sand. Factory Clearances and all dismantling work undertaken. 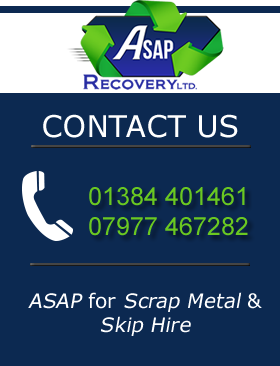 ASAP Recovery Ltd specialise in the recycling of all types of ferrous and non – ferrous metals. © Copyright 2016 ASAP Recovery Ltd | All Rights Reserved.